Growing your own food means taking advantage of the growing season in your area. However, various options are available to extend the growing season to harvest more greens. If you are looking for a way to extend the growing season of your garden, then a straw bale cold frame is a great idea. You might be surprised at the results that can be achieved when this is set up at your home. A straw bale cold frame is basically a miniature greenhouse that is built using just a few bales of straw that may already be on your property. If you do not have any straw handy, then see if you have a neighbor, any friends, or family member with extra bales of straw. The size to make a straw bale cold frame depends on a variety of factors. Your straw bale cold frame can be constructed in any size that is preferred. One crucial detail about the size of a cold frame is the area that is available. 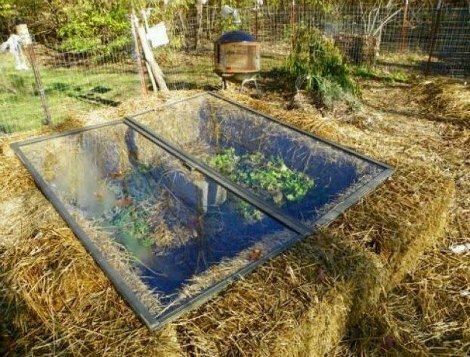 The cold frame will also require the use of glass. Glass for this type of greenhouse can include old windows, a door, or anything that will retain heat and allow sunlight to reach your plants. The best benefit of using a straw bale cold frame is starting a garden in early spring that will continue the growing season into the fall. This is a significant benefit when you want to have food available for meals or other uses. Making your own straw bale cold frame is not too difficult to accomplish. The one thing to realize is a cold frame needs to be placed in an area where there is plenty of sunshine. If your greenhouse is in any areas that have shade, then your results will be disappointing.